Using a giant Teddy Bear Chair to help children feel comfortable and at ease when they visit their Bellevue Dentists was the idea of Dr Patricia Pauley at Brookside Dental Bellevue. 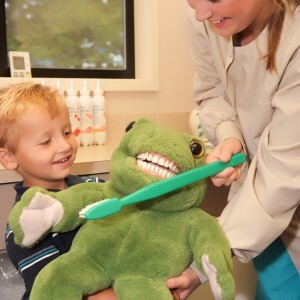 Getting children to feel comfortable with their dental environment is a major step toward maintaining a healthy mouth by preventing tooth decay and establishing good oral health at an early age. The Teddy Bear Chair was patented by Bellevue Dentist Dr Patricia Pauley and was featured in the Seattle Times Newspaper (Monday, August 12, 1991, pg 4) in a large article about Seattle Area Inventors’ Dreams. Children at Brookside Dental Bellevue under the age of 12 are examined and have their teeth cleaned in the friendly confines of the Teddy Bear Chair. All young children that are first time visitors to our Bellevue Dentistry Offfice are given a free ride in the patented Teddy Bear Chair. In addition to the Teddy Bear Chair, the entire room is set aside for children and is decorated with balloons and stuffed animals of all types. 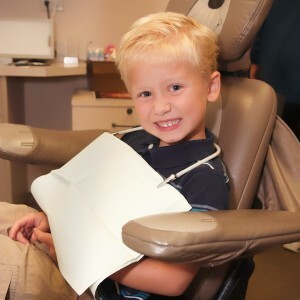 After the children have had their initial visit and free ride in the chair, they are comfortable and relaxed during future visits to Brookside Dental Bellevue. Seattle Family Dentists to use and understand the potential value of dental sealants, which she has been using for about 25 years on her young patients. Although Dr Pat and Dr Cindy specialize in Cosmetic Dentistry, they continue to provide exceptional family dentistry to all of their patients and their families. Additional information about the many dental services that they provide can be read by visiting other areas of the Bellevue Brookside Dental Website.